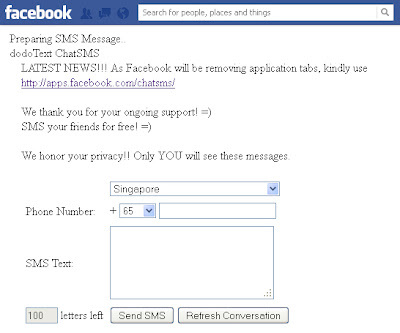 There are lot of sites that allow you to send free SMS using their service. However, you need to signup with that site and enter your personal details. This sometimes does bothers a lot of us, and many hate signing up just to avoid those spam emails that often fill up your inbox. The world's number one social networking site Facebook makes communication a lot simpler, and how can it refrain from providing this very simple service to its precious user base? There is an app that allows you to send free SMS to anybody. 1. Sign to your Facebook Account. 2. Go to this Facebook Chat Application. 3. This is how it looks. 5. Enter the recipient's mobile number. You can send messages up to 100 characters long. Also make sure you don't send abusive messages just because they are free - the recipient can see your name.